The fungus responsible for causing white-nose syndrome in North American bats has been discovered in the United Kingdom. Psuedogymnoascus destructans, formerly named Geomyces destructans, was found on a live bat in early 2013 and later during sampling at five sites in Kent and Sussex on England’s southeast coast. Fortunately, unlike in North America, the bat was in good health and there have, so far, been no signs of mass die-offs of bats. This has scientists cautiously optimistic that UK bats, like those across mainland Europe where the fungus had been previously confirmed, may be resistant to the devastating disease. 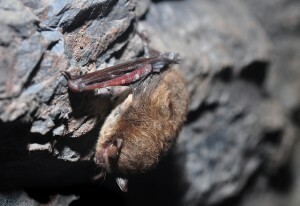 The sampling was done by the Animal Health & Veterinary Laboratories Agency (AHVLA) Wildlife Group (under the Diseases of Wildlife Scheme) and Bat Conservation Trust as part of a British surveillance program that was started in 2009 in response to the spread of WNS across North America. As a result of the findings, the Bat Conservation Trust is now asking those visiting bat hibernaculums in the winter to stay vigilant, to follow guidelines and to decontaminate their gear with antifungal spray before and after each visit, particularly if they have been or are about to travel abroad.